Roast chicken is a preparation that really intimidated me. There was this one time that I tried it and it resulted in burned, undercooked, wasted chicken which decidedly swayed me to buy grocery store rotisseries or broken down parts. 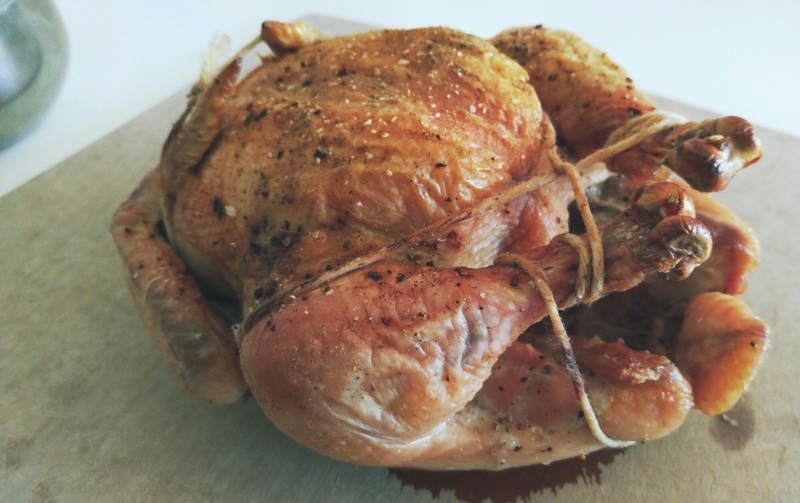 As part of eating “wholer” and nutritious ingredient foods, and part of conquering recipes that make me nervous, I bought a whole bird from a local farm — of course pasture-raised, organic, blah blah — and cooked it up. So up there, those are the money shots of my chicken pre- and post-roasting. 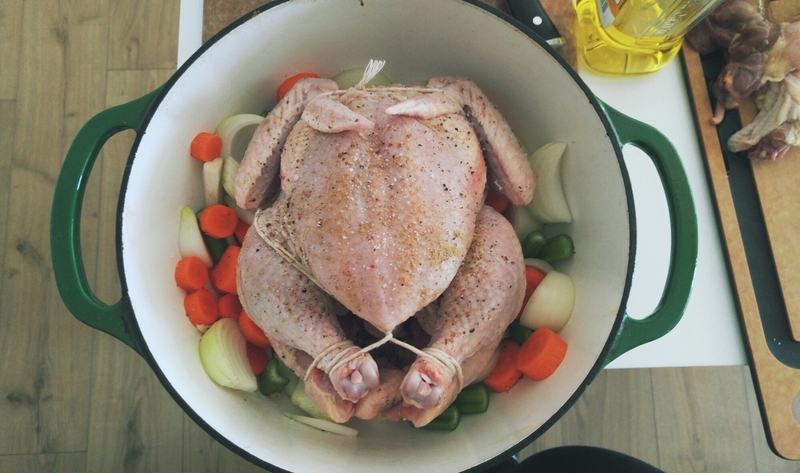 I dried off, seasoned with S&P and dried thyme, trussed, and gingerly layed the whole bird on a bed of mirepoix in my dear dutch oven. Meanwhile, I was heating up my oven to 450°. Once the oven beeped, in went my chicken for about 60-70 minutes. At the 60 minute mark, the breast was at 156° so I left it in for another 8°. And there it was! Beautiful, perfectly prepared and tasty! My technique is based on Thomas Keller’s 3-ingredient preparation as demoed here. Thank you Chef Keller…the simple preparation was indeed simple and yielded a delicious bird!